Hey there guys! 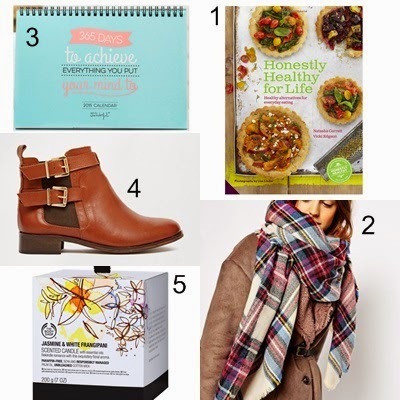 If you took a look at my last entries I'm sure you saw my beauty products gift guide. Okay, so today I'm sharing with you five non beauty products who can be interesting as a christmas gift for some friend, family members, or whoever you want. As you can see there is a healthy recipes book which I think is pretty useful for those who wanna eat healthy but don't know what how or also for avoiding the boring rutine of not knowing what to cook. I also thought that a scarf like the one in the picture or a similar one would be nice because come on, who doesn't love scarves? The following item is a Mr Wonderful calendar because I totally love Mr Wonderfull stuff and it's like a good way to organice yourself a little. Okay, the next gift I thought about was a pair of chelsea booties because they are a must for autumn/winter and I love camel shoes, you can style them with almost everything, so here I go with this one. And the last one but not least is a Body Shop scented candle. The reason why I've chosen a candle is because they are so relaxing and makes people feel calm and not stressed and scented candles left a smell in the room which is oh so perfect.